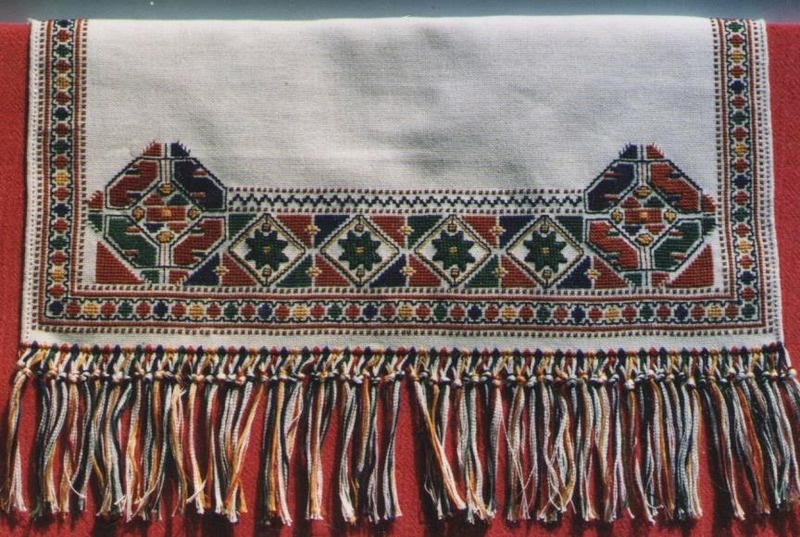 Some years ago the Edmonton Needlecraft Guild along with the Greek Kyklos dancers invited Joan Petrakis to Edmonton to teach an emboidery class. A number of members of the ENG took this class...but not me. Why was that? Well I was likely up to my eyeballs in little kids and with husband working out of town most of the time there was little time for fitting in a weekend class and no one to babysit small people. I have been enjoying the company of a group of friends from the ENG for many years. The Greek gal had this lovely finished piece on her table at one visit and I complained that I didn't know why I hadn't taken that class. I loved this piece. One of the other gals in this group came the following week and flung a package at me saying ' here you are...enjoy'. It was the kit from the Joan Petrakis class. Grace had added it to her UFO box and never intended to finish the piece. Well with that in hand I really had to hop to it. Well I must have hopped around the world a few dozen times by now. Grace gave me this kit at least 6 years ago and I have faithfully taken it to the Wednesday stitching group to work on it over all of those years. And I am finally finished. 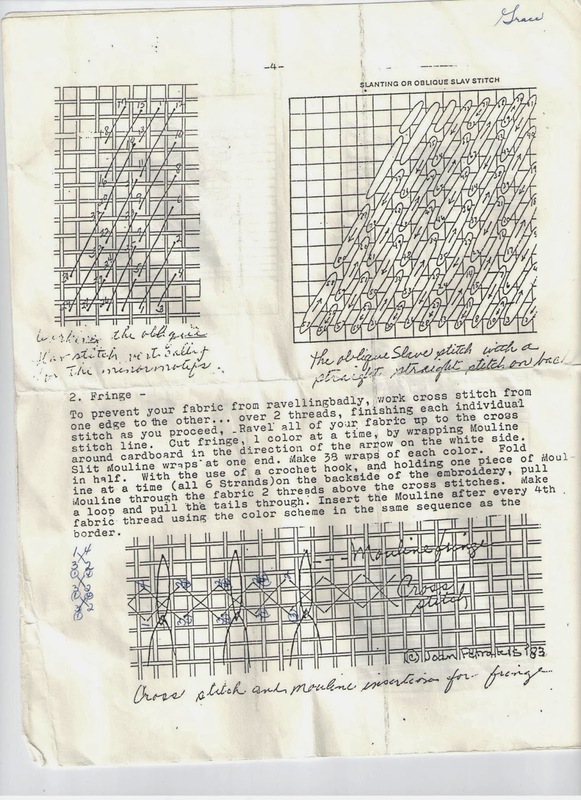 Joan Petrakis taught this class in about 1983 - at least that is what the copywrite on her notes say.. By the way these are notes typed on probably an IBM Selectric typewriter with hand drawn illustrations. Anyone remember that. 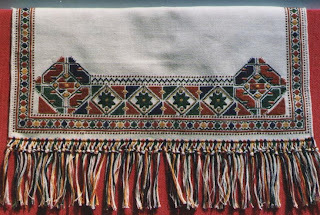 This was done long before the iPad and iPod and Adobe Illustrator and Embroidery design software and likely long before any of you even owned a computer. I have to tell you that my family did own a computer in 1983. It was a 'portable' weighing in at about 20 pounds (remember those) with a screen about 5 X 5 inches (remember those). We've come a long way baby! 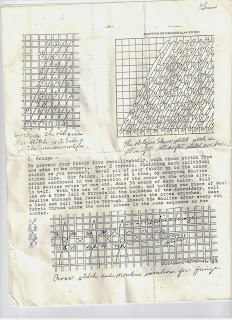 Here are photos of the embroidery and of Joan's notes for this class. Enjoy a wee bit of nostalgia...and No Grace I am not giving you this embroidery back. You can come to my home any time to enjoy it here. Thanks a mil for your generosity!